In an effort to put up some content, I am including a sweet picture. 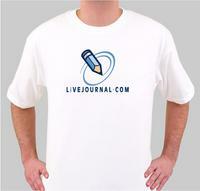 Check out the cool t-shirts you can buy from LiveJournal. I haven't place my order yet because I can't decide on a color. Last night I made my triumphant return to the gym. I figured I needed a little bit of weight lifting before the summer time, I can't wait to go to the beach. I don't know why I ever stopped going, it is such a refreshing experience. Of course at this time tomorrow I will probably be sore and not feeling so refreshed, but for now I feel great. Some of the usual suspects were at the gym, it is strange how in your daily life you can recognize so many people without actually knowing them. It was most common when I used to ride the rail, you would see the same people almost everyday, but never say a word to them. I think there is a certain comfort in this phenomenon, which I have been missing since taking the T, so far there is only one woman I recognize. I sure do miss the familiar faces from the rail, but definitely don't miss the extra hour and forty minutes a day commuting. The gym also in some strange way inspired me to stop at the grocery store and pick up some food for the rest of the week. It is amazing to me how much food you can get for such little money. For less than twenty dollars I bought enough food for the rest of the week. I was disappointed to find out that they don't make Cheese Nip Crisps anymore, I thought for sure they would be here to stay.